No idea who the others are. I’m sure that’s hugely unfair to the Chairman… no doubt even as we read he is preparing a mammoth volume of policies and ideas that will arrive before Friday. Well before Friday. If not I’d be shocked. Shocked I tell you! Posted by Garibaldy in Irish History, Media and Journalism. The following comes from a story by Jim Cusack in today’s web edition of the Sunday Independent. One of the key incidents in the outset of the Troubles in 1969 was the sectarian murder of a Protestant man, Billy King, who was kicked to death by Catholic rioters outside his home in the Fountain area of Derry. Billy King, who was killed in September 1969, and Kevin McDaid, who was kicked to death last Sunday, were both aged 49 and both the fathers of four children. Neither was involved in any form of militancy and both were killed merely because of their religious backgrounds. The killing of Billy King and several other Protestants by Catholics prompted the retaliatory violence by Protestants, who invaded Catholic areas of Belfast, leading to the British government’s decision to call in the British army as the then under-strength Royal Ulster Constabulary was on the verge of collapse. Leaving aside the fact that the final paragraph makes no sense due to a grammatical error, this is utter nonsense. The British Army was sent onto the streets of Northern Ireland in August 1969 in response to attacks by loyalist and state forces on the Bogside and subsequent rioting elsewhere in the North, especially Belfast and Armagh. Cusack has a very bad track record on factual accuracy, but this version of events is so grossly wrong as to completely misrepresent reality, and in essence blames northern Catholics for the bigoted and vicious behaviour of reactionary unionism in this period. Frankly, someone who claims to be an expert on Northern Ireland who writes this nonsense ought to be sacked. Posted by WorldbyStorm in Irish Politics, Social Policy. I had to laugh reading the Irish Times report of a clash between Ronan Mullen and David Norris in the Senate. Actually, it’s telling, isn’t it considering this piece on the socially conservative right, to see our most public elected exponent of same in conflict with one of our more clearly socially liberal politicians. DAVID NORRIS (Ind) clashed bitterly with fellow Independent Ronan Mullen over the exemption of the churches from the operations of equality legislation. Hmmm… hardly unparliamentary, but perhaps a little more heated than the usual discourse in our Second chamber. Those who have met Mullen will attest that in person he’s actually rather pleasant, whatever some of his views (as indeed is Norris). Still, it must be difficult for him given the current situation. Mr Norris had earlier proposed, unsuccessfully, that the House debate a motion he and Independent colleagues Joe O’Toole, Ivana Bacik, Shane Ross and Feargal Quinn put forward, calling on the House to request the Government to re-examine the exemption, which he contended was unsustainable, especially given the latest revelations about abuse. Mr Mullen said he did not see Section 37 of the Employment Equality Act as protecting the privileges of any church. Here are the relevant transcripts of Wednesday and a sort of reprise the next day… Enjoy or weep… the choice is ours. Senator Rónán Mullen: I compliment my colleagues on raising the issue of alcohol. I was present at the NUI Galway alumni event at which the Ard-Stiúrthóir of the GAA spoke and I raised the issue of alcohol advertising in connection with GAA events. Let us be clear, the reason alcoholic drinks companies advertise or connect themselves with sporting organisations and activities is to piggyback on the glamour associated with sport. No one is as sensible of the glamour associated with sport as young people. I am reminded of the courageous point of principle taken by people such as Dr. Mick Loftus, a former president of the GAA. I wish there were others like him who see clearly that alcohol is a serious problem in our society. 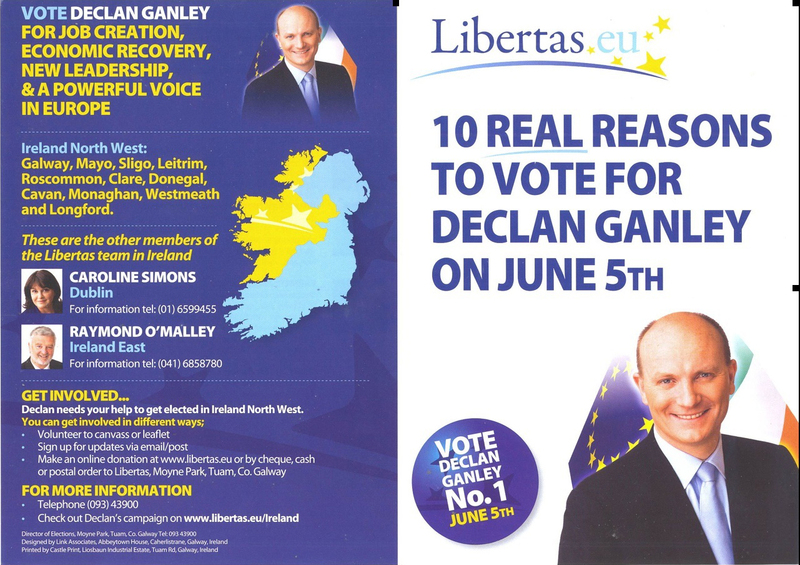 I call for a specific Seanad debate on alcohol advertising. We could make a great contribution by having that debate soon. Unlike my colleague, Senator O’Toole, I felt hope when I saw the Christian Brothers’ statement. Time will tell which of us is right. I read into it that there was a preparedness to be generous. Time will tell. I warned yesterday of my fears that a kind of anti-Catholic bigotry would re-emerge under another guise. I have concerns about people raising extraneous issues. For example, my colleague, Senator Norris, does not like section 37 of the Employment Equality Act. I do not see that as protecting the privileges of any church. Senator David Norris: It does, because it puts them above the law. That is a privilege. An Cathaoirleach: Senator Mullen should be allowed to speak without interruption. Senator Rónán Mullen: I see it as protecting the rights of different groups in society, in conscience, to an education that reflects their ethos. People who raise such issues at this time, which are extraneous to the needs and concerns of victims, in particular, run the risk of being accused of being cynical or manipulative at a time when we are all struggling to deal with a grim reality. Senator David Norris: That is a classic smear from you, you smug hypocrite. An Cathaoirleach: Please. Senator Mullen should be allowed to speak without interruption. We are taking questions to the Leader. Time is running out. Senator David Norris: I object to my reputation being taken in that way. It is quite disgusting and repellent. An Cathaoirleach: Senator Mullen has the floor and his time is up. We are having questions to the Leader. Senator David Norris: You do it all the time in a sly kind of way, but you will not get away with it with me. An Cathaoirleach: Senator Norris should not interrupt, please. Senator David Norris: I am not having my reputation sullied. Senator David Norris: If the Cathaoirleach does not protect me I will protect myself. Senator Rónán Mullen: In the light of that I will reserve any further comment for the substantive debate. An Cathaoirleach: We will not go over yesterday’s business again. Senator Jim Walsh: —–of any Senator. We should be able to debate these issues. Senator Norris’s ego needs to be reined in somewhat. Even his colleagues on that side are saying that it is out of control. Senator David Norris: Perhaps I should be reined in with a lasso. An Cathaoirleach: This is not relevant to the Order of Business. Members should put questions to the Leader on the Order of Business and should not speak against or for other Members. Senator Jerry Buttimer: Hear, hear. Senator Fidelma Healy Eames: Put a question. Senator Eugene Regan: Senator Walsh should respect the Chair. Senator Jim Walsh: It is relevant because I am dealing with a matter that was raised yesterday on the Order of Business. I would welcome a debate on equality matters. The equality agenda, while good, has been hijacked by sectoral interests. An Cathaoirleach: The Senator’s time is up. Senator Jim Walsh: I was appalled that a pub on the north side of Dublin was destroyed by a group from the Traveller community that ran out of control. We need to debate that issue. Publicans, who have an obligation to run and manage their premises, are not in a position to decide on who they will serve because the equality legislation is not being used as intended. Senator David Norris: That an is untruth. Travellers are entitled to be treated as individuals, not as a single group. Senator Jim Walsh: If the Senator listened more instead of mouthing off in the smug, bigoted way that he did, it would enhance the debates in the Seanad. Senator Fidelma Healy Eames: I am horrified by the details of the horrific death of the troubled teen, Melissa Mahon, a 14 year old girl. When we look at the facts of the case, it seems everyone has failed this child, including her family, the monster who took her life and also the HSE. To be taken into care in this State should mean care, and care that works. An Cathaoirleach: This is a matter still before the court and not yet fully decided. I do not want comment on it. 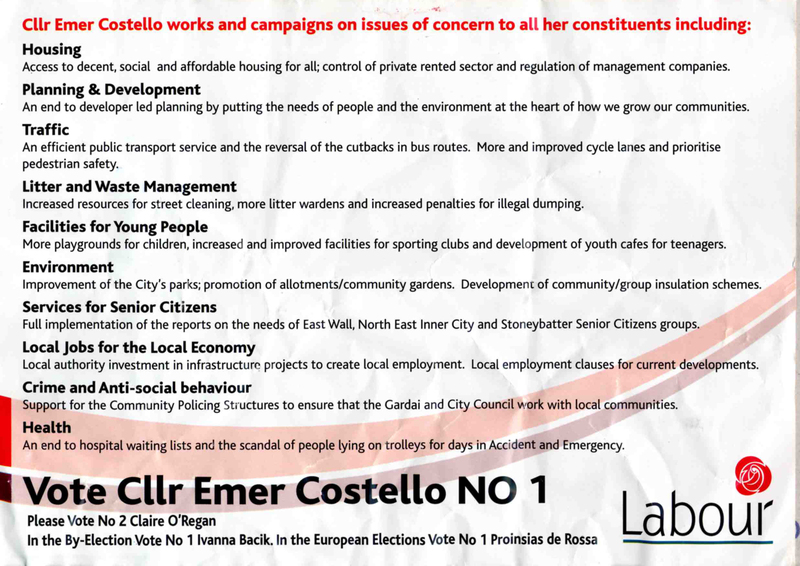 Posted by WorldbyStorm in Dublin Central Local Election and By-Election Promotional Material. I’ve been surprised by how little material I’ve received from Ivana Bacik during this campaign. I don’t know why that is. I will say that after x number of weeks of posters and flyers ever I who has more than a usual interest in such things really would like a bit of a break from it. So roll on next Friday and Saturday [BTW, my thoughts such as they are on the latest poll I’ll post up over the next day or two, all I’ll say now is that it’s great that the left in all its shapes and forms is doing so well in Dublin]. And I’ll bet the candidates are counting down the days. Nah, strike that, I know they are. And the canvassers. Posted by Garibaldy in Complete nonsense. Gotta love the Yanks. This story will raise memories among those who heard it of a joke doing the rounds in Belfast during the war in Bosnia-Herzegovina. Stoner rock. Stoner rock. I still have a very faint hiss in my right ear in very quiet environments for which I can thank Hermano last year. But, let’s ignore Hermano and listen to something a little more boundary breaking, a little more, shall we say experimental. I talk of course of California’s Yawning Man, a band of near brilliant obscurity. I try to keep up with these things I actually hadn’t heard their music before last weekend. But I got a hold of their album Rock Formations… and… you know what, I like it. It’s a curious mix, instrumental, a curious surf like twang, something a bit prog. Something a bit Felt-like as well in the guitar sound. More driven though, perhaps a more metallic edge. But only slightly. And is that a theramin I hear on Perpetual Oyster? Anyhow, here is the music… no videos. Of course not. Just fan based clips. Posted by Garibaldy in Northern Ireland, Sectarianism. Yesterday nine men were charged in connection with the brutal gang attack that resulted in the murder of local community worker Kevin McDaid and the attempted murder of another man. In the aftermath of the conclusion of the Scottish Premier League season that saw Rangers take the title from Celtic on the last day, a loyalist gang mounted an attack on a predominantly Catholic area of Coleraine, and Mr. McDaid, his wife and at least one other man were brutally beaten. It seems that tensions in the area had already been raised by a planned loyalist band parade and the flying of tricolours in the area. There are a number of important strands to this story that go beyond the immediate tragedy of the death and injuries. The first is that this is a brutal reminder that despite the Good Friday Agreement and power-sharing, sectarianism remains the defining reality of life in Northern Ireland. It is especially virulent in many small towns where violent clashes and intimidation remain rife. Beyond these obvious signs, we should not forget that the overwhelming majority continue to live lives completely separated from one another, and of course we now will have a private Catholic and a private Protestant transfer test for those wishing to go to grammar schools, which add class to religious segregation. The murder of Mr. McDaid raises other issues. The first is that of paramilitary involvement. The police have specifically said that the attack was not an organised action carried out by the UDA. However, of the nine people charged, several are members of the local loyalist band whose parade has been a source of contention, and one is an ex-member of the UDP. This suggests very strongly that the people involved in the attack were linked to the UDA. This does not necessarily mean that the attack was a sanctioned UDA operation. There are parallels with other murders over the last number of years believed to have been carried out by members of paramilitary groups but where the organisation itself has been absolved of responsibility. This is probably the case, but the unpleasant reality is that the overall interests of the political process mean that the boat would probably not be rocked by membership charges in such cases even if it weren’t. It is a reminder as to why the structures of paramilitary organisations must be dismantled, something which has largely happened with the Provisionals but hardly at all with loyalist paramilitaries. This statement stinks of equivocation. To equate flying a line of scruffy bunting with taking a man’s life is absolutely jaw-dropping. The eventual absent-minded description of the murder as “very sad” only adds to the insult. Depersonalising acts of visceral violence is a standard evasive manoeuvre in Northern Ireland. First the act is characterised as “a reaction”, transforming the perpetrators into mere parts of a mechanism. Then the consequences are imbued with some abstract property, like sadness, as if concrete human decisions played no part. He also quotes Ulster Unionist MLA David McClarty on the allegation of UDA involvement in the murder. “We have to moderate our language and not go throwing blame where no proof has been given as to who was responsible for this incident.” This type of equivocal language is familiar across the decades of the Troubles, where unionist politicians have often been ambiguous in their attitudes to loyalist paramilitaries to say the least. The inherently sectarian nature of NI politics is evident here – we must extend understanding to “our side” who ultimately have their hearts in the right place unlike the other side. While such attitudes persist, there will always be a climate that enables day-to-day sectarianism and confrontation to flourish. The family wish to make it clear that they are concerned that the PSNI were involved in negotiations with a number of persons perceived to be from the Loyalist community on Sunday the 24th of May 2009. “The family are concerned regarding the nature of these negotiations and the attendant claim that threats were made by individuals from this background to police that violence would ensue unless certain demands made by them were met. “It is a fundamental tenet of a civilised society that individuals such as these should not dictate the terms of law and order. “We are further concerned that given the prior knowledge of the threat, neither we and nor our neighbours were not properly protected by police. “We want the community to support the police, but equally police must also support the community. Hugh Orde has responded to the family by stating that there had been negotiations in the area between loyalists and the residents of the area attacked, in which Mr. McDaid had been involved, to try and reduce tensions. He also said that the police dictated their activities and no-one else. Except that’s not really true, is it? On first glance, the idea of the police negotiating with loyalists seems very problematic, especially in light of what followed. However, the reality is that in interface areas the police negotiate with all sides on a regular basis. And the reality also is that these negotiations can be and have been extremely useful in preventing and containing violence in many areas, including during controversial marches. Politicians and people from all sides praise the police when such tactics work. I doubt that this was the first time that the police in this area had been involved in discussions with the local residents, and I also suspect that such negotiations have had positive effects. The tragic death of Mr. McDaid should not blind us to this fact, nor should there be a knee-jerk response that assumes the police were automatically in the wrong to have become involved in negotiations. Clearly the police response to the mounting tensions and the violence must be examined for mistakes or negligence, but we need to keep things in perspective. Overall then this murder should not be viewed as an isolated incident. It is the direct result of the type of society and politics we have Northern Ireland. Sectarian attitudes, and ambiguous attitudes to incidents of sectarian violence, permeate our society. They are a cancer, as is the presence of paramilitary groups. Until we root out these diseases, the symptoms will continue to break out. In the current circumstances, with peace and power-sharing, added to the economic crisis, we – north and south, as well as Westminster – have taken our eye off this vital issue. The binning of the Shared Future strategy almost as soon as the DUP and PSF assumed power was one such sign. There are many others. Sectarianism still has the capacity to kill workers. It still poisons and destroys their lives. Progressives must step up their campaign against it. I’ll parse this out in greater detail over the day, but that’s a mighty fine poll we see in the Irish Times this morning. And mighty intriguing given that I’ve been hearing that on the ground that there is something of a (whisper it) swing in sentiment back to Fianna Fáil. That party remains mired at 20% – down 1%. Fine Gael is on 36% – down 2%, the Labour Party is on 23% up 3%, Sinn Féin is on 8% – down 1%, the Green party is on 3% – holding steady and Independents are on 10% – up 1%. Well, look at the satisfaction for the Government and the Taoiseach. There is some consolation for the coalition in the fact that the satisfaction rating for the Government and the Taoiseach has risen a little over the past two weeks after plummeting to record lows in the last poll. The Government’s rating is up 2 points to 12 per cent while Mr Cowen’s is up 3 points to 21 per cent. Green Party leader, John Gormley is also up 2 points to 27 per cent. 12% for the Government. I wouldn’t be breaking out the champagne. At least not quite yet. Fine Gael leader Enda Kenny sees his rating drop by 2 points to 31 per cent. Labour leader Eamon Gilmore remains the most popular political figure although he has dropped 2 points to 49 per cent while Sinn Féin leader Gerry Adams is down 1 point to 33 per cent. Interesting that as we draw closer to actual voting the trend is very slightly downwards. This isn’t going to save the governments bacon, this isn’t chickens coming home to… er… roost…not at all, but… perhaps those reports I’m hearing aren’t so far off the mark. It’s going to be disastrous for Fianna Fáil, and the Greens will do well to see only minor losses. But, is it going to be utterly or only somewhat disastrous? For Labour this may well be quite good news, something to break their run of less good luck since the announcement that George Lee was contesting Dublin South. 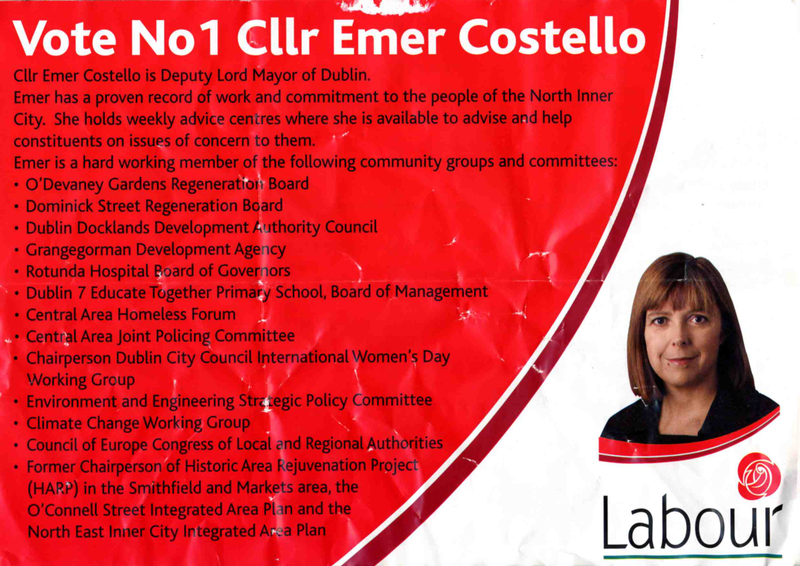 Another leaflet from Emer Costello, who is putting considerable effort into the campaign, this time provided courtesy of Wednesday. There’s a small spelling error on it. Can anyone discover it? 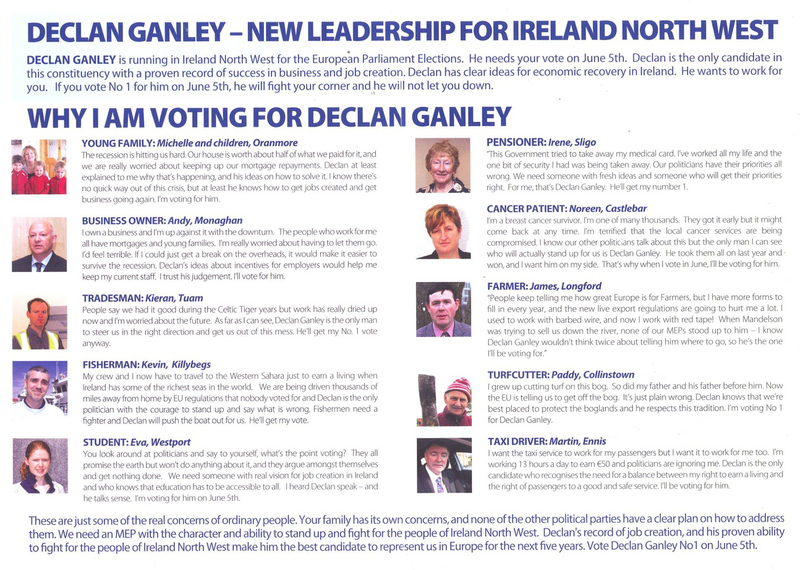 As ever I’ll gladly post up any literature from left and center-left candidates/parties as I get it or as it is sent to me… usual address see email on right hand column. Posted by WorldbyStorm in Education, Irish Politics, Social Policy. We’ve been talking about public sector reform a bit here, and it’s an interesting discussion. Yet an area that would surely be well-served by reform would be the payment by the Irish state of teachers wages in fee-charging schools. The current debacle at Alexandra College where a Junior Cert student was ejected from the school – whatever the somewhat murky details which seem to be not entirely clear – points up a couple of realities about the nature of private education. ALEXANDRA COLLEGE has moved to defend its controversial decision to remove a Junior Cert pupil over non-payment of fees. The move came as the National Parents’ Council requested the immediate reinstatement of the pupil. It also follows an RTÉ interview with the mother of the pupil in which she accused the school of using “Dickensian” and “very cut-throat” methods to victimise and humiliate her 14-year-old daughter in front of her classmates. Last night, the school refuted several of the charges made by the mother in the interview. It said it felt compelled to provide further clarification because of the parent’s decision to go public and the intense media interest. The school said the the outstanding debt “spanned two academic years, and the college engaged in exhaustive exchanges and proposed a series of compromises to address the arrears of fees, with a genuine desire to reach a solution. Fabulous… and what of that keyword in our contemporary societal climate – transparency? The statement came after a special meeting of the governing school council last night. The Church of Ireland Archbishop of Dublin, Dr John Neill – who is the ex officio chair of the council – attended the meeting. The school yesterday refused to disclose the full membership of either its school council or its board of management. But this is a new age, and where once such matters would have been concealed behind a deftly pulled curtain of silence where the child would have walked away with no further words the parent has, understandably, gone to a higher court of appeal than a School Council. The mother of the pupil – named only as “Marian” – was interviewed on 2FM’s Gerry Ryan Show on Tuesday. The mother said she had attempted to make the payments on a phased basis but this was unacceptable to the school. She explained how she was separated and was coping with the collapse of her business. She claimed the school authorities handed her daughter bin bags and told her to “pack all her stuff and clear her locker out”. Last night, the college said it was “saddened to hear these serious allegations . . . which are far removed from the reality of what occurred. “Media reports of how the pupil was removed from a class, that some teachers discussed her family’s financial situation with her and that she was asked to pack her belongings in a black plastic bag, are incorrect. The student’s family owed in the region of €20,000. Annual fees for boarders are over €16,000. The school has stressed that the pupil will be allowed to return to sit her Junior Cert in Alexandra College next week. Which is big of them, not least because by my rough calculation they’ve already gained the best part of €50,000 off the parent across three years. The National Parents Council post primary (NCPpp) asked that the student be reinstated “so she can sit the Junior Cert exam without undue stress”. In particular and in the context of the Oireachtas Committee on Education the schools actions are a revelation. We’ve heard no end about the special ethos of the fee-charging sector, and in particular about the Protestant schools within that sector. This most certainly is an excellent insight into that ‘ethos’. It is indeed special. Very very special. In our Mission Statement, the purpose and the ethos of the College is clearly stated. We endeavour to remain true to that characteristic spirit in everything we do in the College. Alexandra College is a private, all girls, secondary school with an enrolment of 620 students. It is also a boarding school with a capacity for 170 boarders.The diverse backgrounds and nationalities of the students creates a wonderful web of relationship which lasts a lifetime. And what does the Mission Statement tell us? to develop and fulfil her own unique potential. same time to continue her lifelong learning process. enabled and still maintains the foundation. growth and the common good. 1. To promote and develop the aims of Alexandra College. parents, teachers and Board of Management. communication with the Board of Management. social development for the pupils of the college. educational facilities of a high standard. 6. To promote student welfare. Alexandra College was founded in 1866 to give a new sense of purpose to the education of young middle-class ladies in Ireland. The prevailing system did not provide young ladies with any opportunities for real academic involvement; nor did it prepare them for any engagement in public, social or academic affairs. Educating women for a domestic role was regarded at the time as the essential objective of a “good” educational system. The system was largely in the hand of governesses who themselves lacked a grounding in mathematics, history, classics and philosophy. Anne Jellicoe decided to address that inadequacy and put right the prevailing inequality against women. Her first idea was to open a College to educate governesses. This gave way to wider plan to provide a liberal education for young ladies that would sharpen their academic consciousness, and encourage them to take up ideas and issues that exercised the minds of the thinking men of the time! Laudably honest in its position on social class – eh? And not a word about such unpleasantness as the ability to pay the fees across the educational lifetime of an individual student. Or, indeed, what happens if a family falls on hard times. I’m genuinely sorry for the girl at the centre of this but on one level it is difficult not to feel that, hard-hearted as it may appear to be, the school is entirely within its rights to eject her, whatever the details. These are fee-charging institutions. They make no pretence that they’re in this for love. No indeed. It’s money. Otherwise why charge the fees? And we could also argue that the plight of the mother, now separated and ‘coping with the collapse of her business’ is nothing more than a contemporary morality tale. After all, no-one forced her to send her child to the school. This was her exercising her ‘choice’, a choice that was possible to her and not to many many others because she had the disposable income at the time to spend on education. And in that context one could reasonably ask of the mother, what else did she expect? When education becomes a commodity, to be bought and sold, then it is entirely contingent on the ability of a purchaser to have the wherewithal to purchase. That said, it’s a tad more complex than that. Justice would suggest that a child should sit her exams without stresses and Alexandra College has, as best one can judge from the reports handled this with a degree of sensitivity so lacking in common sense that you can only gaze in awe from the sidelines. Beyond that though, the fee-charging schools, as seen at the Committee, make strenuous efforts to avoid any implication that pecuniary matters are at the heart of what is essentially a transaction – heaven forfend! It’s a service they provide, a service that is – so they imply – undifferentiated to that available elsewhere in the education system. Indeed this service is a vital additional element, although how and in what respect is never clearly articulated. But our present woes are throwing up some of the contradictions in this stance. Here, after all, is a young child whose educational future, once so bright, is now clouded by the possibility that she will no longer attend a fee-charging institution. Now, if everything elsewhere is so rosy, if there is no particularly differentiation, other than – perhaps – some near intangible ‘cultural’ aspect one could reasonably enquire as to why … by the way, why am I slipping into a near 19th century style of ironic communication – it’s going to be prithee this and prithee that next… the parent is so exercised. Sure, her child will miss Alexandra College, but there’s a whole voluntary non-fee charging secondary sector out there to explore. Enrolment at fee-paying schools has risen since the abolition of third-level fees, with parents who had previously set aside funds for college ploughing the money back into their children’s education at second-level. Figures released by the Department of Education last year showed that the number of new pupils in south Dublin’s state schools had declined whilst enrolment in the area’s fee-paying schools had steadily risen. As I say, I understand entirely the motivation that parents, any parent, brings to the feast as regards education. The wish for them to do as well or better is very powerful indeed and can overwhelm rationality (after all, €20,000 for a years fees? Precisely what sort of outcomes is that going to ‘guarantee’, even in the more nebulous area of social standing?). Parents often have been to the institutions they put their children through, there’s an acculturation process there. But I have the feeling that just as with housing – and Conor of Dublin Opinion made this point elsewhere, that there is a delusion that people can essentially ‘bet the house’ on the market – the idea that it is possible to ‘invest’ on an individual basis in education and the facile idea that we – or those who can afford to – can all make ‘choices’ that have no down-side is being superseded by events.